My First Sketchbook, Part 1 | | My Thoughts... Exactly! When I began attending Art Center College of Design (ACCD) in 1977, I was 19 years old. I was one of the youngest students in the school. Younger than me, as I recall, were Frank Ordaz, Emmanuel Amit, Tia [Wallace] Kratter and one or two others. I was scared. Seemed everyone was 23 or older. They had been to college already. There were requirements that were daunting. Only a few years earlier the administration had stopped requiring male students to wear white shirts and ties to class. It was still a strict environment—many of the teachers were at the new facility in Pasadena, but had come from tenure at the “old school on Third Avenue.” They brought with them the old ways. I, for one, thought that was a good idea. I wanted to learn Illustration the old way. I wanted to learn to draw and paint from teachers who were working and succeeding during the Illustration Heydays; the 1930s–1950s. We were required to keep a sketchbook with us at all times. At least one teacher would make this a demand, pretty much covering for the rest of the teachers who would make the same requirement. The sketchbook, above left, is a 29-year old sketchbook. (Click it to see a large scan of it). The very one I carried with me everywhere. 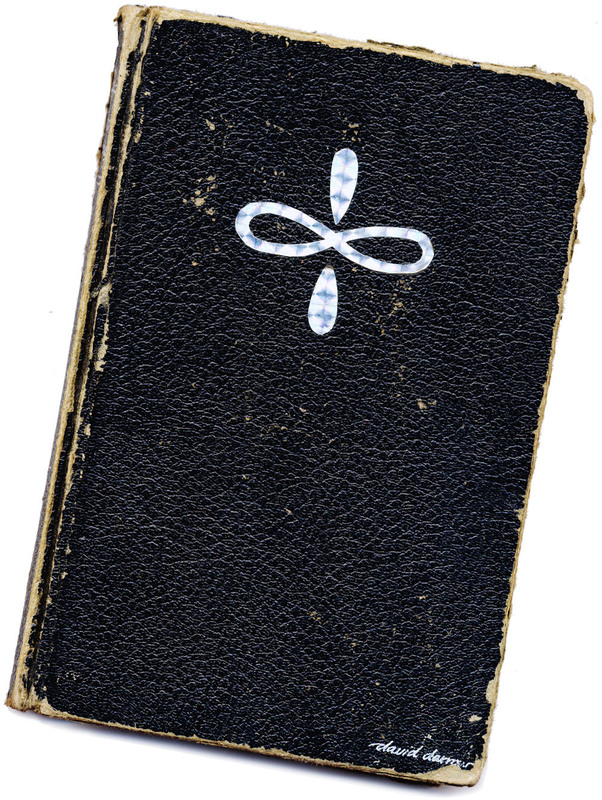 I decorated it with an ancient religious symbol signifying my membership in the Fraternal Order of Norman Rockwell. Actually I just lied. It was a totally random shape cut from the remains of the holographic mylar sticker-tape my buddy Brock and I used to make a SUNBUG logo for his beige VW Beetle in 1978. Having narrowly escaped participating in the 60s due to our youth, yet still influenced by the psychedelic artwork of that era, we chose Arnold Boecklin for the font. No one told me that All Caps in a display face is just bad typography. In that sketchbook I would keep my class notes, my required “daily drawings” (I never did them daily) and my ideas. Along with all that were my “A.D.D. Compensations.” These little artworks were — as crazy as this may sound to someone who does not sport ADD — my way of focusing on the lectures. There is nothing more painful to a 19-year-old art student influenced by ADD and nearly entirely visually driven, than having to listen to a lecture about visual things. I usually sketched cartoons or caricatures of my teachers while they talked. One course I had was Color Theory, taught by a chain-smoking, salty and weathered, mid-fourties, old-schooler named Judy Crook. Now when you’re ADD enhanced—as I like to call it—your mind picks up on repetitive sounds and patterns. They are just rhythms and sounds. Not words. And so, like a catchy beat in a song, like the piano and drums intro in Rikki Don’t Lose That Number the pattern gets absorbed and memorized, only later to be studied and analyzed for content. I thought it was odd that I was being taught a basics course that was all theory, reduced further by its mere relativity. It would be decades before I would come to understand the enormous value of everything I was taught by Judy Crook in my second term at ACCD. She had a way of burning-in the meaning and correct naming in the terminology of color: hue, saturation, value, tint, shade, intensity… but what would baffle me for years was the concept of the relativity of it all. All the rules were only good so far as the way they were described, but would fall apart in varying degrees based largely on the colors surrounding—and thereby visually influencing—a given hue. It’s still a difficult thing to pay attention to even as a painter, some 29-odd years later. Find her on the internet somehow, and let her know your thoughts. You just might make her day. And who knows? she could probably use a good day. Yes. Judy was brilliant. Her assistant was hoping to publish her color theory notes, unfortunately I don’t think it ever happened. I am teaching an illustration class now trying to pull together Judy’s knowledge to present to my class. Not an easy task. Loved Judy’s class! If she only new that color has become an ongoing theme in my life since her class she would be smiling now! Still have her Lecture Notes: Color Theory and Application. Treasure them. 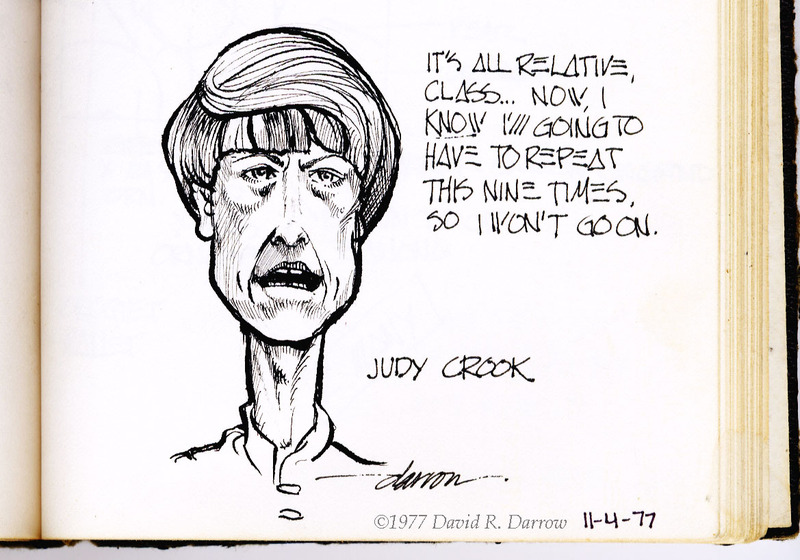 For some strange reason, I googled “Judy Crook” and came across your blog. Judy was one of the most influencial teachers I have ever had (I attended Art Center in the 70’s). I would love to find anything about her, bio info, course notes, etc. so if you have anything and want to share, I would be grateful. I notice that your post was in 2006 . . . and here we are 9 years later. You are quite right, she was brillant and her teachings have made a lasting impact on my career. Nice of you to drop by. I have no other information on Judy. It’s a shame that there was no Internet back then (1977–1980, for me). We could have researched our instructors and found out all about them. David, she was an amazing teacher and Her class has made a huge impact on me. I was googling her name and I came across this site. I wonder if Art Center knows any news of her?